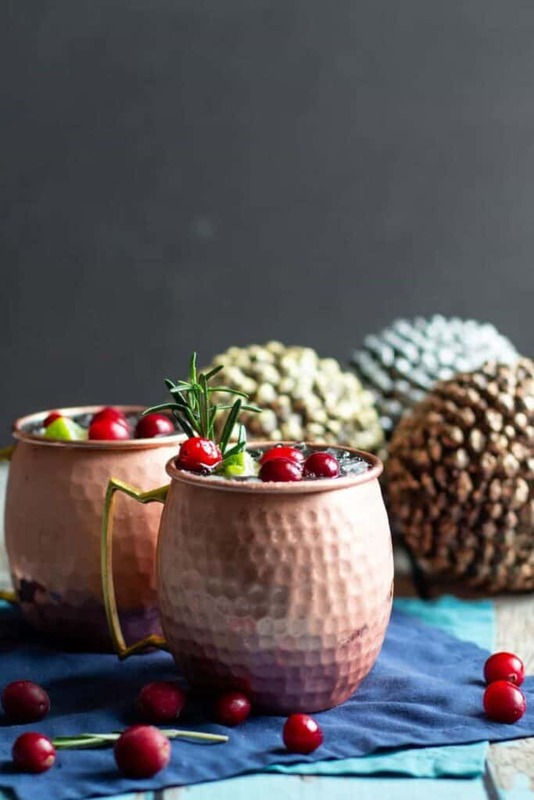 This Cranberry Vanilla Moscow Mule is sweet, spicy, and totally refreshing. They are perfect for the Winter months, and the Winter holidays in particular. Cranberry juice lends beautiful color and tartness while ginger beer adds fizz and spice. The vanilla vodka keeps things sweet and interesting. Happy New Year, everyone! For many of you, this may be your first day back at work after the holidays. I feel that pain. I’m back in the office after being out for nearly two weeks (!!). Was it fun while it lasted? Absolutely. Am I wishing that I was slightly more productive over break? Yes. Alas. I think we could all use a drink after the work day is through. Looking for more Moscow Mule recipes? Boy do I have you covered. 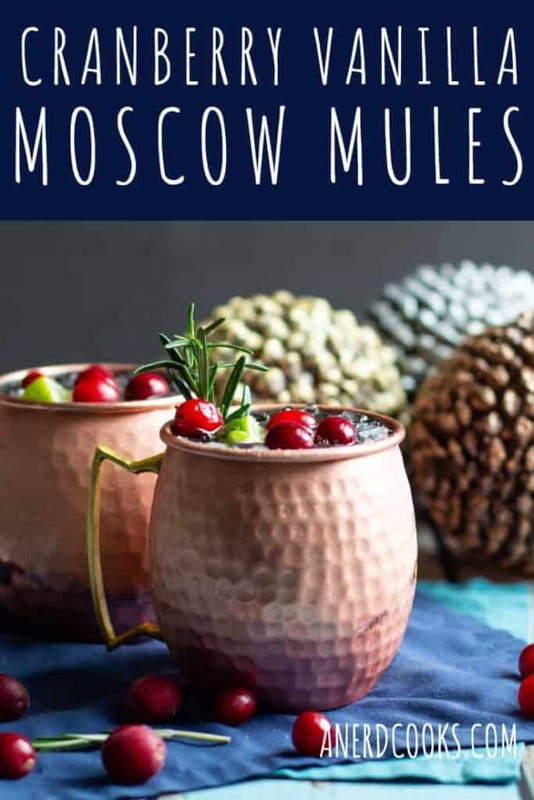 If you’re in the mood for more vodka-based Mules, consider the Caramel Apple Moscow Mule or Pomegranate Champagne Moscow Mule if you’re feeling extra fancy! If you want a bourbon-based drink, there’s the Old Kentucky Mule, Maple Bourbon Moscow Mule, and Bourbon Moscow Mule. Last, but certainly not least, the Mexican Moscow Mule has all the tequila lovers covered. 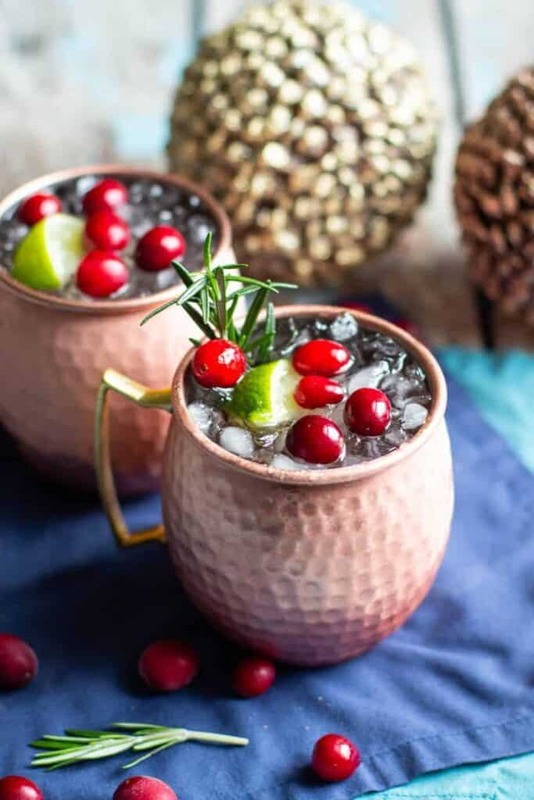 In a copper mug over ice, add the vodka, cranberry juice, ginger beer, and lime juice. Garnish with fresh cranberries, a lime wedge, and a sprig of fresh rosemary. I got copper mugs for Christmas so you better believe this drink will be entering my back to work life this week. Gorgeous photos! I love a good Moscow Mule! They’ve become one of my favorites, too! I can’t get enough of them. I think that these mugs were just some cheapies I got at Target. 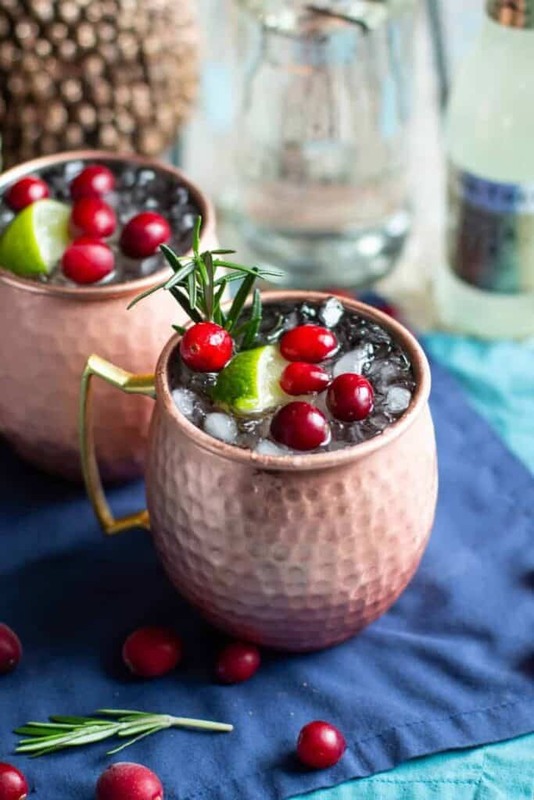 I love a good mule drink and this one looks as festive as they come. I bet it tastes delicious! 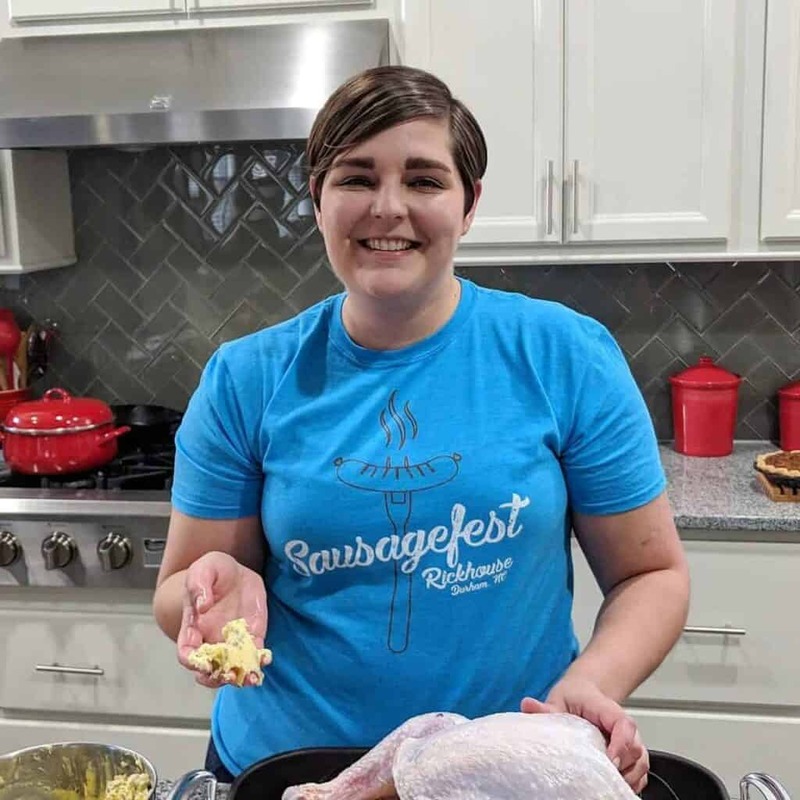 Hoping I can make some this holiday season myself. This is my kind of holiday drink! I love this flavor combo! Yum! 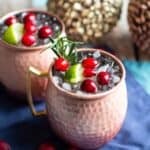 I love your twist on the Moscow mule! I bet the flavors go so well together! I’m going to make this for my sister this weekend when she comes over! I hope you and your sister love them! I’ve never tried a Moscow Mule but yours looks so seducing that it’s hard to resist even if you don’t want an alcoholic drink. With rosemary as one of my favorite herbs you just can’t go wrong. Thanks for stopping by, Gabi! 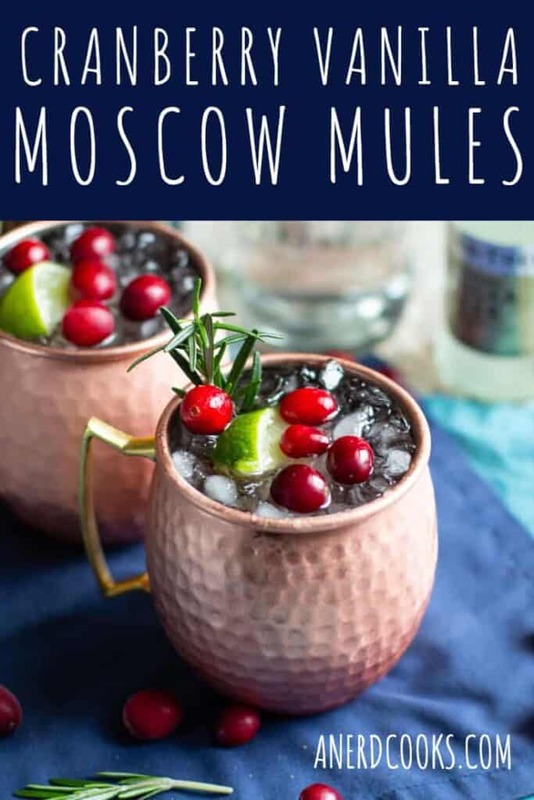 Moscow Mules are some of my favorite types of cocktails. If you aren’t in the mood for alcohol, I can tell you that some cranberry juice and ginger beer (with a sprig of rosemary for garnish!) makes a lovely mocktail.